As the first arrivals begin to stroll the rows of stalls, they are met with the sight of not just fruit, vegetables, cheeses and bread, but brightly coloured clothes, the latest fashions, shiny watches and silver jewellery, books, household objects, plants, pots, tools... you name it, you can probably find it on the market. What could be more French than the traditional street market? The Languedoc, like all regions of France, is packed with market towns, and there is a market held somewhere in the region on almost every day of the year. They range in size from enormous, covering several squares and many streets of a large town, to tiny, with just a handful of stalls selling seasonal produce. In some towns the market is held every day, in others, just once a month, or only in the summer. Some markets specialise in certain goods and types of goods (for example, food and wine or arts and crafts), while others offer up almost everything you can think of. 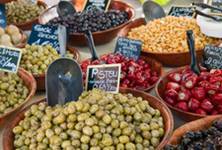 Regional influences can be as strong as seasonal ones, so in the coastal towns you will find a preponderance of seafood and near to the Mediterranean you can also find markets selling olives, olive oils and locally produced wines. There is always something special about a market town on market days. Wherever you are in Languedoc-Roussillon, go on, get out of bed, grab your basket and head down to the market. What follows is a selection of markets from around the region, and is by no means a comprehensive list. It gives brief descriptions of the different markets, their times and locations, and, although everyone will have their individual opinions on the best markets, this guide will help you make a start in deciding how to enjoy your own French market experience. The Cours de la Republique, the main street of the town, is the place to find fashion, jewellery, books, bed linen, waxed tablecloths and household goods. The main square is also part of this general section. This is also the place to find hot foods, with spit-roasted chickens, paellas, Moroccan-style couscous and other delicious dishes cooked as you watch. Moving on to the next square, usually a car park in its everyday life, you find the Gipsy Market, a treasure trove of cheap tat mixed with the occasional brilliant bargain! Next, and perhaps the best of all, is the delightful food market in the pretty Place Verdun. Here you find all the fresh produce, cheeses, charcuterie, herbs and spices, and a Vietnamese stall to tempt your taste buds. The old open-sided market hall is here too, and adds to the picture of authenticity and charm. A word of warning here though, parking is a nightmare as all the main parking areas are swallowed up by the market, so although it involves a short walk it is best to leave your car down beside the canal. Carcassonne (Carcassonne Property Guide), also in the Aude (Aude Property Guide), is always a delight to visit, and as the main city in the department it has a lot to offer, including some excellent markets. Saturday is its main market day, and takes place all around the town centre (the lower, more modern town, not the historic walled city) selling absolutely anything! 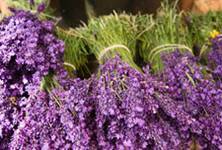 It is especially well known for fashion and flowers. The market takes place all year round, rain or shine. Pezenas in the Hérault (Hérault Property Guide) has another of the region's favourite Saturday markets. Ask almost anyone which market to go to and they will suggest Pezenas (Pezenas Property Guide). The market gets underway at around eight o'clock in the morning, and it pays to arrive as soon as possible after that as it gets incredibly busy in the summer months. It is a really huge and colourful market, taking over much of the town's centre, and is a general market in the truest sense, offering all types of goods. Other recommended general markets are held in Narbonne in the Aude and Perpignan (Perpignan Property Guide) in Pyrénées-Orientales on Sundays; the pretty fishing village of Collioure (Collioure Property Guide) in Pyrénées-Orientales on Wednesdays and Sundays; the cheery town of Ceret (Ceret Property Guide) in Pyrénées-Orientales on Saturdays; and Montpellier (Montpellier Property Guide) in Hérault on Wednesdays, Sundays and Tuesdays. As a general rule, the biggest and best of the markets take place in the biggest towns, but don't let this deter you from visiting some of the smaller ones, which can be utterly charming and really enhance the French market experience. Of these, slightly off the beaten track, Villefort's (Villefort Property Guide) Thursday market (Lozère) is worth a mention, as is Goudargues's (Goudargues Property Guide) Wednesday market (Gard). If the general markets bring a treat to the table in the Languedoc, turn your attention now to the specialist markets. The Languedoc is as fortunate in this respect as it is with its ordinary markets and market towns, and it is well worth getting out and about to discover them. Whatever your interest, odds on there will be a corresponding specialist market taking place somewhere in the region. As these are sometimes fixed events, but also sometimes "one offs", it is best to keep an eye on local newspapers, and look out for posters put up in the villages which give details of up and coming events. The ones mentioned below are among the best loved, but simply serve as examples as there are many, many more. Antiques are very popular in France, of course, and there is no better place to browse for that special find than the antiques market in Pezenas. It takes place twice a year, on the second Sunday in October and the first Sunday in May, and is, simply enormous. Narbonne (Narbonne Property Guide) also has an antiques fair in July. If flowers are your thing, get yourself to Béziers (Béziers Property Guide) on Friday mornings. Held in the Allées Paul Ricard, it is a spectacular treat for the senses. The truffle market in Uzes (Uzes Property Guide) in the Gard (Gard Property Guide) really is something different, and quite an experience. Truffles, along with their monetary value, hold a mystique unlike anything else, and this exciting market is a great place to learn more about this revered culinary ingredient. It is also tremendous fun, with demonstrations of truffle hunting by dogs and pigs. Carcassonne's Christmas market is as picturesque as the old walled city, even if it does take place in the central square of the newer part of town. Pretty chalets set up around a temporary ice rink, selling sweets, gifts, and hot, mulled wine. Bedecked with tinsel and fairy lights, they create a truly magical experience. These take place on designated days throughout the summer around many towns and villages. Usually less generalised than the normal, day-time markets, they tend to be quite arty affairs, showcasing local arts and crafts, but often including specialist products such as cheeses from small fromageries near to the towns concerned, charcuterie and of course, local wines and olives. The atmosphere is quite romantic, often enhanced with fairy lights and having traditional French music playing. The night markets are quite small, but provide a delightful, personal experience as the stall holders have more time to talk to you and are only too delighted to explain the origins of their special products. So there you have a taster of the Languedoc markets. Some you may visit only once, others will call you back time and again. The markets of France are far more than just a place to buy fruit and vegetables, or to browse for gifts to take home from holidays; they are an essential part of French life, a place to meet up with old friends, to chat, to treat yourself and to celebrate la vie en France.